On a break from advertising biscuits, Chelsea and Belgium footballer Eden Hazard is doing his best to alienate the club’s fans. Well, he is if the BBC and Sun’s back-page headline is to be believed. 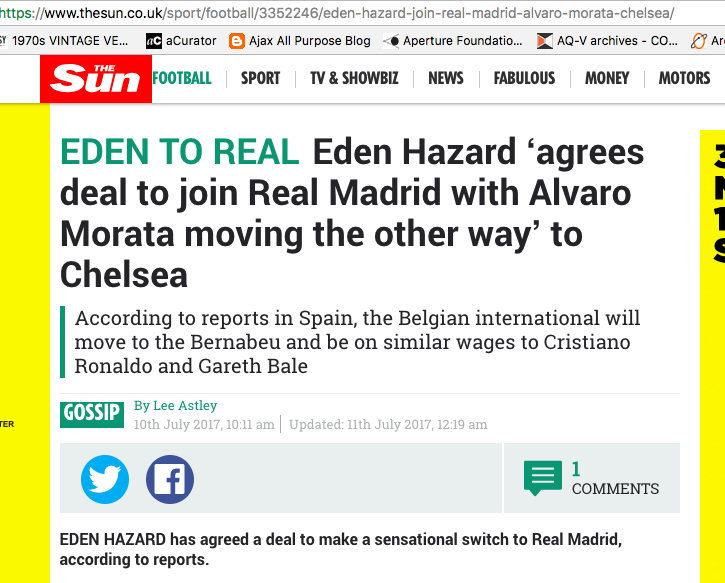 “Belgium forward Eden Hazard, 27, has warned his club side Chelsea that ‘Real Madrid could interest me’,” says the BBC. 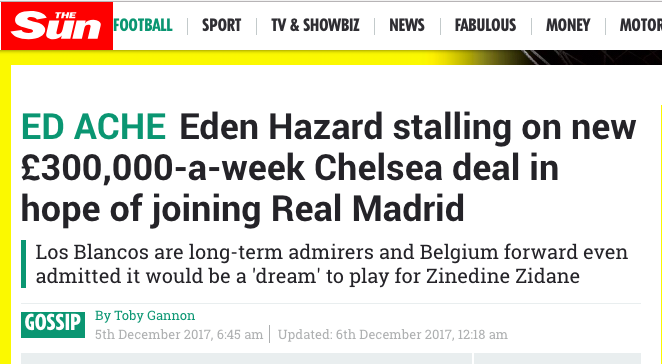 The Sun leads: “EDEN WARNING – Eden Hazard has warned the club he will quit unless they sort things out in the summer.” Warning your employer to work hard to please you is an iffy move. But is that what Hazard really said in an interview with L’Equipe before he flew to Moscow for the World Cup? What can we believe? Reporting on Hazard is so much more clickbait than fact. Reports like… this one in the Sun from July 2o17. The word ‘agrees’ is in inverted commas but fro SEO purposes hazard to Real Madrid is a statement of fact. Not that the Sun is alone in milking the ‘Hazard has gone nowhere for years’ story. 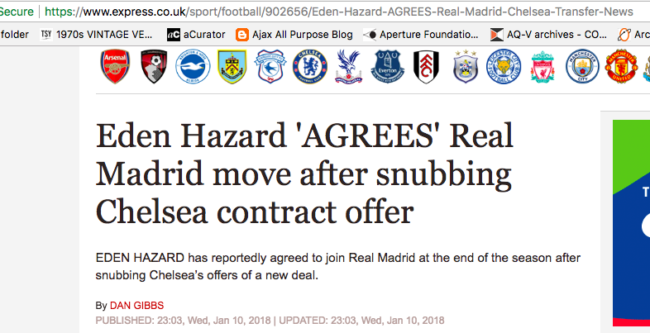 In January the Independent said Hazard was staying at Chelsea. Fact. Really? No. He said nothing of the sort. Asked to elaborate on the factors that would influence his decision, he added: “I’m waiting for new players next season. I want good players, because I want to win the Premier League next season. He’s not warning Chelsea over anything, is he? Hazard’s Chelsea contract runs til 2020. He’s not going anywhere unless Real Madrid or any other club pay a huge transfer fee.